Electrical engineers design, develop, adapt, install, test and maintain electronic components, circuits and systems used for computer systems, communication systems, entertainment, transport, biomedical and other industrial applications. In this major, you will have the opportunity to investigate the technology, design and applications of devices and equipment that use electrical energy. You will learn to develop high technology systems that generate, store, distribute and use electrical power and gain technical skills in areas such as communications, power generation and electrical machinery. You will learn to use computer systems, lasers, and other tools to develop and improve the medical equipment used to monitor, diagnose and treat health problems. Engineering at Griffith is ranked #1 in South East Queensland for student satisfaction and teaching quality. 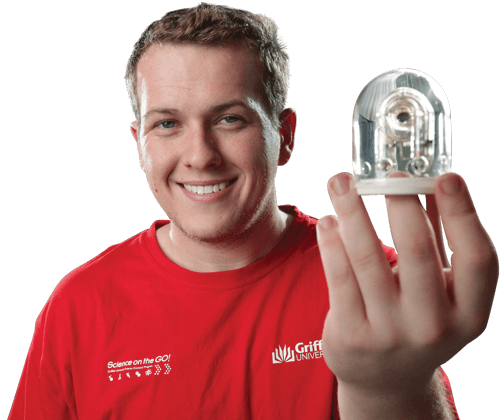 At Griffith you will be more than just a student, you will be a junior engineer working on real projects from your first year. Your journey in electrical engineering with Griffith will allow you to mix leading-edge education with hands-on experience in state-of-the-art laboratories, interactive large scale modelling and visualisation. We maintain strong links with the industry ensuring our programs are relevant to industry. These linkages also give you the opportunity to experience our work integrated learning placements, providing you with invaluable real world experience and excellent employment opportunities. Jared has always had a curiosity about electronics and communication systems. As an engineering student he continued to pursue this interest through a major in electrical and electronic engineering. 'My degree has given me knowledge across many fields of electrical engineering including communication systems, electromagnetics, waves and propagation, practical electronics, power engineering and transmission, digital signal processing and microprocessors.' Jared was able to extend his knowledge and gain valuable global experience in his final year through the completion of a thesis and work placement at Helmut Schmidt Universitat in Hamburg, Germany. He now works as a graduate engineer with multidisciplinary, professional services engineering company, SMEC. With rapid transformation occurring across industries and a greater emphasis on green technologies, electrical engineers are set to play a vital role in building our future society. Electricity and electrical and electronic devices reach into all aspects of our lives in the form of heating and cooling, lighting and power, communications and computing, entertainment and information systems. The electrical engineers who produce and supply the electrical energy and equipment meeting societies every need and thereby providing us with the sophisticated and technological lifestyle to which we are accustomed, play an essential role in our modern world. Electrical engineers can expect to gain employment in industries such as mining, manufacture, entertainment, technology, transport, power utilities, the defence force, sustainable energy infrastructure and research.